This little guy arrived in February of 2015 from Tennessee. His story is one of both human indifference to the suffering of animals, and of human kindness and compassion. Two weeks earlier, as a rare polar vortex? swept south, bringing record subzero temperatures to states like Tennessee, two women noticed a neighbor’s dog still chained up outside. ?On Wednesday a friend and I rescued a Jack Russell mix from what I believe would have been his last night alive ‘temps that afternoon were in the teens with a windchill in the single digits. That evening was to bring temps in the negative. My neighbor had their 14-year old JRT outside, tethered to a fence post, long enough to get inside the igloo and that was it. There was no visible food or water, as the bowl (an old margarine tub) was on its side and empty. There was no bedding or hay inside the igloo to offer any sort of insulation from the cold. We knocked on the door and got no answer. At that point I decided it was probably best to spring into action and get the police involved, as other neighbors informed us that the dog had been out since the night before. The owner ended up showing up while I was on the phone, so I politely declined police help and asked the owner if he?would be taking the dog in, as it was bitterly cold and there was no way this dog was going to survive these temperatures. He said no, so I asked if I could take him in so he had a chance. They allowed me to take the dog. Upon getting the dog situated, we noticed he was infested with ticks and his collar was partially embedded in his neck. The dog was taken to a local vet where he was treated for ticks. The baby is doing well now, however we are in dire need of a foster. 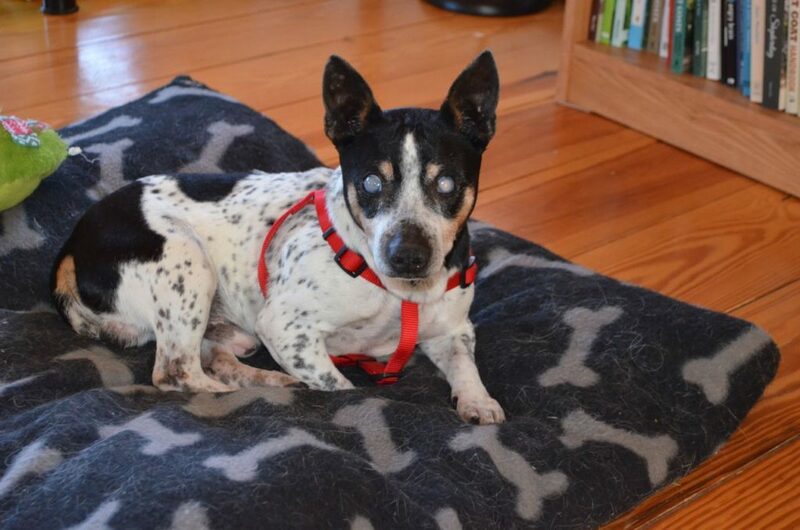 Taco, that’s his name, is completely blind and has never known the inside of a home. The dog’s owner subsequently relinquished ownership to them, and the two ladies then?contacted local rescue groups, none of which could help. That’s when they contacted us. As luck would have it, our pet transport company had a driver?heading that way. Just five days after getting the original email asking if we could take Taco, he was here at the farm. Despite his age and the awful life he had endured, our veterinary specialists found Taco was in surprisingly good health. And we were delighted to learn that for a dog who had never lived indoors, Taco turned out to have wonderful house manners. 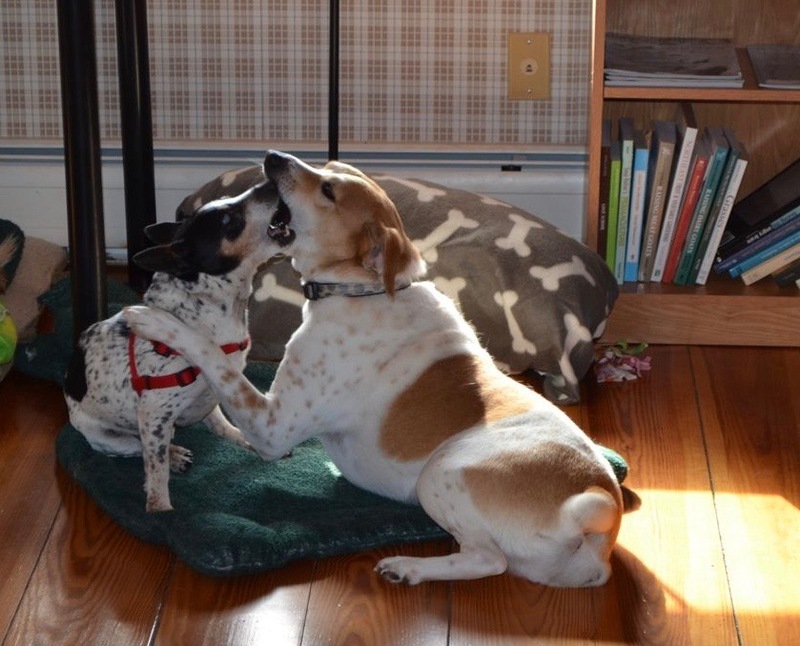 Taco soon discovered the joys of having friends to play with, and spent hours roughhousing with his new best friend, Tanner. Throughout the day we could hear Taco and Tanner wrestling in the living room, grunting and woofing at each other. Even though he is quite elderly, he acts like a puppy at times. It was as if he?d never been able to have any fun when he was younger, so he is making up for lost time now. Taco also made another joyful discovery here chew toys! He will lie on a bed quietly chewing away, absolutely content to shred one toy after another. 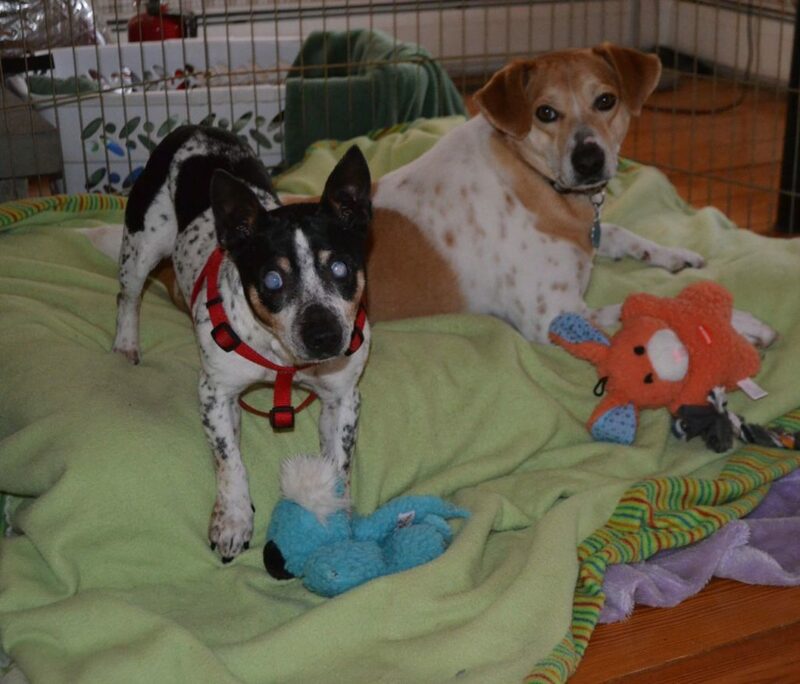 Best of all, he gets to enjoy his chew toys while lying side by side with his buddy Tanner! For Taco, his new life doesn’t get any better than this.